Jerusalem Magistrates Court discusses new Arab tombstones in central Jerusalem cemetery following Arutz7 report that it is a ploy to gain land. The Jerusalem Magistrates Court held a discussion on Wednesday regarding the ancient Muslim cemetery in the city’s center. The Muslim Waqf had asked the court to force the Jerusalem Municipality to stop the actions it has taken to remove the false graves that had been planted in the area, in an attempt to add property to the cemetery.. The false graves had first been reported on exclusively by Arutz7 in August. The graves had been dug in the Mamilla Cemetery, an ancient Muslim cemetery which is located on the outskirts of Jerusalem's Independence Park. The cemetery had been in a state of severe disrepair for more than a century, despite being under the supervision of the Waqf. Recently, however, trucks, tractors and other heavy machines were spotted in action as they dumped building materials which workers then shaped into Muslim-style tombstones with no one buried beneath them. Dozens of these faux-graves were being created on the eastern end of the park. A visit to the cemetery by an Arutz7 reporter found approximately 100 such tombstones. 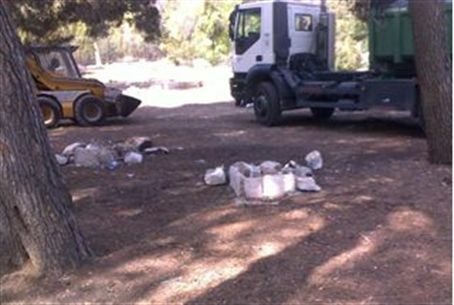 Following Arutz7’s report, the Jerusalem Municipality and the Israel Lands Authority began removing the tombs. It was speculated that the false graves were part of a plan to have the Muslim Waqf submit a demand for the additional land to be placed under Muslim ownership. Later it was reported that the same phenomenon was occurring in the area of the Eastern Wall in Jerusalem (adjacent to the Western Wall), with the Arabs simply ignoring a law that deems the area a national park. The Jerusalem Municipality pointed out during Wednesday’s hearing that the cemetery in question is an ancient cemetery which is being maintained and restored by both the State of the Israel and the Municipality, using a budget that has been allocated by the state for this purpose. The Municipality added that all the graves that had been removed were not ancient, but rather new and fictitious ones, and that the removal work was supervised by the Israel Antiquities Authority and the Israel Lands Administration, which owns the land. According to the Municipality, a total of 300 false tombstones have been removed and it will continue to enforce the law to prevent any attempts at illegal building or attempts to take over public land.